After passing his Senior Matriculation exam on his 18th birthday, this youngest of five children drove out from his home in Govan Saskatchewan to the Recruiting Office in Regina. 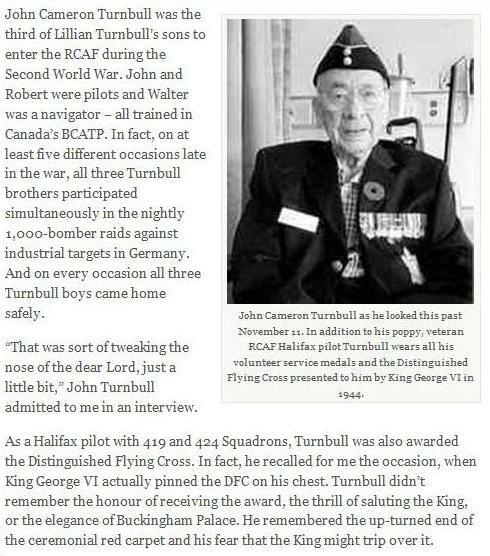 In all, three of the Turnbull brothers would join the RCAF and proceed overseas as aircrew. 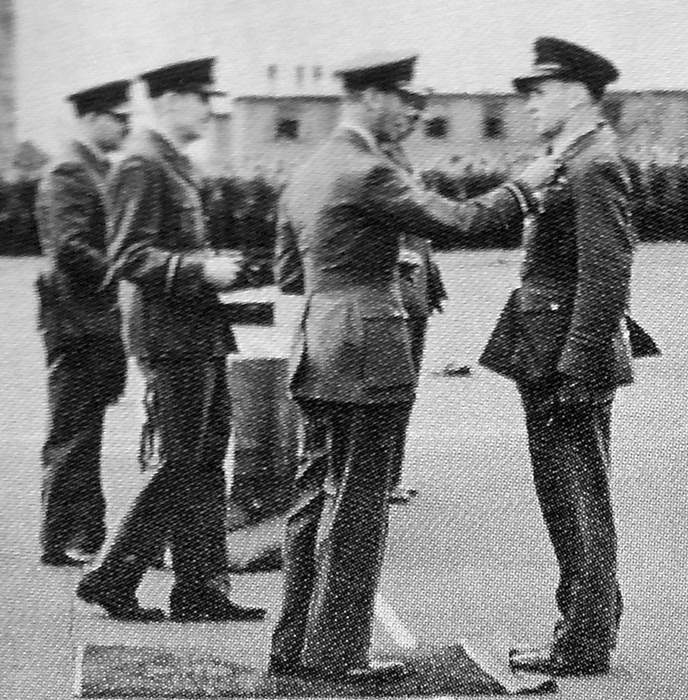 With completion of Manning Depot training at No.3 at Edmonton, Turnbull like many who completed this stage of their new military career found he was posted to duties which were unrelated to becoming an aircrew man. Guard Duty at No.15 SFTS at Clarkesholm, Alberta, aircraft everywhere but not for those guarding the base, kind of a tease that is for sure. After these Alberta postings Turnbull was fortunate to have his remaining training carried out in his home province of Saskatchewan. April 1st. began his flying days, first at No. 7 ITS Saskatoon, followed by No.6 EFTS at Prince Albert then returning to Saskatoon for No. 4 SFTS. Passing in the top level of his class, his Wings Parade in December of 1942 also saw him receive his commission and a chance for Leave home. His Leave was cut short with orders to report to "Y" Depot at Halifax to be shipped out to overseas assignments. This was changed to leaving from New York, as the train loads of service men arrived at the dock side of the Queen Elizabeth decked out in her war time colours, Turnbull found him self amongst the thousands packed on to the giant passenger liner now doing her duty as transport ship. Mid-January found P/O Turnbull at the No.3 PRC Bournemouth awaiting additional training, which would be at No. 16 EFTS at Derby. A chance to be come familiar with the English countryside and weather, which was vastly different then the spacious and Luftwaffe free skies of Western Canada. His aircraft was one not much mentioned the Miles Magister, which means Teacher or Tutor. The posting at AFU at Church Lawford returned him to multi-engine aircraft flying on the Oxford. The August 29th truck ride from 1659 CU to 419 Squadron was a short one and so was the period of time before Turnbull had completed his 2nd Pilot ops and was on to his first operational sortie with his own crew. Three days later was his 20th birthday and he and his crew were over Europe for the second time. The operation for September 16th aboard VR-S took the crew through the Modane Pass high in the Alps, the ice was building up on the wings and the tips of the propellers. The loss of lift was dragging the aircraft lower and lower with more ice accumulating as they moved through the Pass. They eventually came to 9,000 feet to evade the ice build up and also to abort the mission, as did several others. December 29th operation over Berlin gave the crew and Turnbull another jolt. Just as they were closing the bomb doors, they experienced a heavy thud in the tail section. A shell burst knocked the controls out of Turnbull's hands and the aircraft went into a steep dive dropping thousands of feet. He managed to level out, but returned to base at a low level unable to regain height. 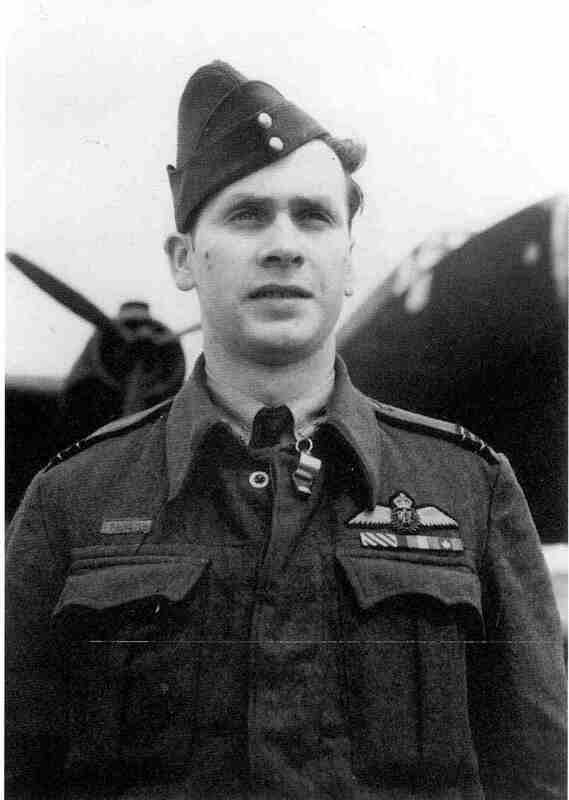 His promotion to Flight Lieutenant on January 21, 1944 was followed by his posting to 424 Squadron,along with his crew, with a detour to Officer's Advanced Training School at Cranwell. On June of 1944 he received his DFC from King George during a Royal visit. It is an event that anyone would well remember. In F/L Turnbull's case it was even more memorable. The whole base was out for the spit and polish affair, the awards recipients were in square facing the King, standing on his red carpet. As F/L Turnbull's turn arrived he marched forward towards the King's position, noticing the edge of the carpet had flipped over. He was worried about the King tripping on it all the way to his position in front of the King. He had no way to tell anyone, protocol being what it is. So when he arrives at the carpet he stands on the over turned section, hoping someone will notice the danger to the King, by his breaking of protocol of standing on the King's rug. This photo catches him still standing on the upturned carpet. Just one of those small tid bits of 419 history that shows, nothing can phase a Mooseman, or in this case a former Mooseman. In November of 1944 he became one of the youngest Squadron Leaders, he was at this time in charge of a Flight at 1664 CU. August 1945 found him headed home to Canada preparing to take part in Tiger Force, which became redundant with the war ending. With the war over his return civilian life included marriage and studies that brought him a pharmaceutical degree. An article on John Cameron Turnbull by Ted Barris of the Barris Beat. are show below. Thanks to Ted Barris, great supporter of Canada's Military History, for permission to use his article.